Alibaba IPO and the World Economic Forum holding World Champion Meeting 2014 in China made all Western eye suddenly turning to the East. There’s a lot to expect from this promising horizon, but one needs to look with careful eyes. Providing in-depth analysis and contrasted view on China’s markets and economy, experts have built a lively game of lights and shadows that reflect Beijing’s upcoming growth and myriad challenges in such a widespread country. WAI is delighted to take you through this Chinese kaleidoscope. Enthusiasm: Indeed. We’ll start with an example. In this article from Les Echos: Didier Saint Georges, a member of Carmignac Investment Committee comments on the RFQII license that his company has recently been granted by the Chinese government. He is affirmative: China is in charge, and dealing “quite good” with the economic growth the country is seeing. From his point of view, the level of growth (which most developed economies can hardly challenge at the moment) still enables the government to roll-out social and economical reforms undertaken. Results are already here: investment are made faster and easier with the new license Carmignac obtained together with BNP Paribas. On following report, Deloitte also noticed that almost half of the GDP increase was due to fixed asset management which grew by 17.3%, as a positive sign of government attempts to spur investments. More business: And yes, progress is being made. As Deloitte points out, China GDP per capita (PPP) in 2010 was $577 and has grow in 2013 to $9,214. Poverty in 1980 (% of population with daily income below $2) stood at 98% and decreased to 27% in 2009. Those numbers have turned China into the second largest global economy, “thoroughly enmeshed in global trade, logistics, investments and production streams”. This is for history and now. For tomorrow, L’Usine Nouvelle says that in a new report published by Norton Rose Fulblright on transports sector, 30% of interviewees see China as the biggest opportunity in 2014, (against 40% in 2010), with construction market specifically focused on China. Beijing, according to Les Echos, has also signed 34 contracts with Bamako to roll out infrastructures (mainly railways) in Mali. Furthermore, China overseas buying by private firms have reached a record high of $23bn last year, as reported The Wall Street Journal. Among them, SmithFieldFood, bought by ShuangHui International Holdings for $4.87bn, Motorola Mobility Holdings bought by Lenovo Groups, $2.94bn, as well as IBM server x86 business by Lenovo again for $2.31bn. Continued attraction: Foreign investments keep coming in. According to Reuters China attracts new U.S. tech firms despite tight control of Internet, even firm reportedly know for being pro-freedom. It is the case of CloudFare who aims at entering the Chinese market by 2015 and is looking for a Chinese partner. China is Cloudfare’s secong largest market by user traffic. They follow unsuccessful firms like Yahoo, eBay, Google and Facebook to enter the largest internet market by population. A managing director at Accenture says “you have to play a slightly long game if you are a multinational company in China”. 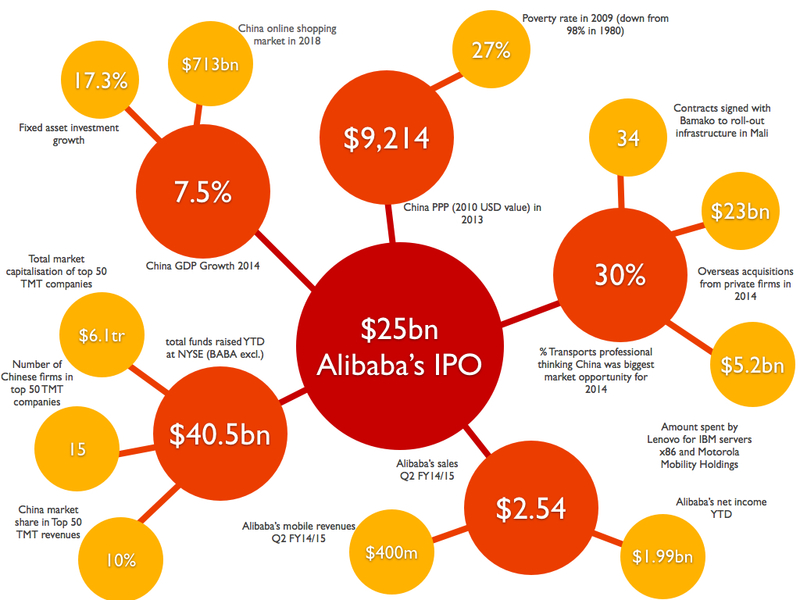 Giant Alibaba: Concerning Alibaba, China deploys the strength of numbers. Jack Ma, Alibaba’s CEO, indicated in a recent report that he wanted to spread his business aggressively in the US and in Europe , with sales that increased by 46% in the second quarter to $2.54bn, and net income tripled to $1.99bn from previous year, as Forbes mentions. In mobile, where Alibaba shows growth despite fierce competition from Tencent, revenues reached $400 million for the quarter, up from $190 million the previous quarter. So Jack Ma went on to launch “the biggest flotation of all times”, as writes The Telegraph on September 22nd. So far, the NYSE has raised $40.5bn for the U.S., and Alibaba might add more than half of this total. A superlative shortage has shaken commentators in the press, so just like Mr Ma, they’ve let numbers talk. $25bn raised by Alibaba, “a record smashing IPO”, comments The Telegraph. It’s only just a start, the online shopping market in China has grown from 74bn in 2010 to 295bn in 2013, and is likely to grow up to 713bn in 2017. And the results are here, as mentions The New York Times: American investors, politicians and consumers are paying great attention to the Chinese giant, and might consider Alibaba’s IPO as a way to buy into the growth of Chinese middle class and markets. The Street says “the pipeline of companies set to list on the NYSE in the coming months is robust, and securing a deal of this magnitude stands to help the exchange as it pitches listings to additional companies in the future”. 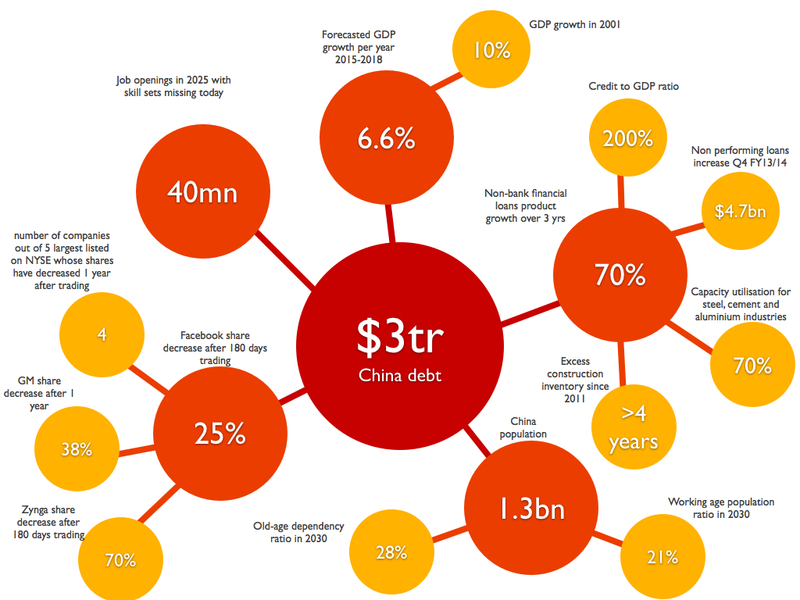 Global economy impact: WEF goes further: “the balance of power in the technology world is shifting from the US towards China, the stock-market launch of Alibaba offers irrefutable evidence”. With this IPO, Alibaba is about to become “the world’s fifth-most-valuable TMT (Technology, Media and Telecom) company behind Apple ($614 billion), Google ($387 billion), Microsoft ($382 billion) and China Mobile ($259 billion)”. WEF has analysed that “the top fifty TMT companies, after Alibaba’s IPO, will have a combined market value of about $6.1 trillion”. The shift of power also uses numbers to speak: “Thirty years ago US companies accounted for the vast majority of this number. Today the US share has fallen to about 66%. The Chinese share has climbed to 10%”. China has imposed 15 of the world’s 50 most valuable internet companies. The author concludes: “It will be far easier for them to expand in the US – organically and through acquisition or investments – than for their American counterparts to do the same in China”. Debt and growth deceleration: As Les Echos explains, foreign investors still invest in China but they tend to do so in a lesser aggressive way than previous years. While it might not be worrying for now, the looming risk of debt is putting pressure on the economy, and anything can become worrying in our connected economies. Deloitte raises questions about government spending policy in the long-term and its impact on debt. They noted that “the stimulus has also impacted expansion of credit which is a risk exposure.” Oxford Economists forecasts growth rate to be as low as 6.6% per year 2015-2018, far below 10% when China entered WTO in 2010. The economy has been partly slowed down by government in order to retain social and financial crisis. Beijing has launched several antitrust investigations that might damage relationships with key partners, as Les Echos reports. The bubble threat: Deloitte also points at the over-supply of housing which “leaves the sector exposed to a potential house-price crash, with repercussions for the wider financial system, households and the public sector”. They found that trust loans and loan products offered by non-bank financial sector have grown by more than 70% over the past three years, bringing credit to GDP ratio at more than 200%, with a rising level of non-performing loans (+$4.7bn as reported by Bloomberg in February). Output prices are slowing growth (6.9% compared to 8.8% expected by OGJ) and producer price inflation as remained negative since 2012. Debt has swelled to $3 trillion due to the shutdown of excess capacities in industry. Builders are under pressure to sell excess inventory, which tends to decrease price. China currently has more than 4 years of housing supply under construction. Demographic challenge: “As demographic dynamics puts pressure on wages, it will be difficult for China to sustain its low charges policy to compete against lesser-developed economies such as textile and leather goods”, analyses Deloitte. China manufacturing unit labor cost vs. US has tripled since 2000. China’s population is ageing quickly but not getting richer at the same pace (old aged dependency rate in 2030 forecasted at 28%), creating a burden to provide healthcare services to families that only have one child (labor population ration in 2030 forecasted at 21%). Although the government has recognised the need to move from investment led to consumption led economy, consumption is not moving fast enough to offset slowdown in investments. China remains a relatively poor country with 1.3bn inhabitants, with income disparities that have grown with urbanization and wholesale privatisation of real-estate. Deloitte points out that “the working age population is starting to plateau, and will decline in the foreseeable future”. At the same time, productivity of working capital is continuing to decline and nation’s debt to GDP continues to climb. Remaining local hurdles: The different urban areas and provinces also have their own rules and specificities, making it difficult for foreign manufacturers and investors to act locally without local partners. In the automobiles industry, Strategy & Business explains how foreigners have to JV with Chinese manufacturers and launch a Chinese brand to address the market. Due to pollution and congestion, local governments create their own rules, assuring short term impact for local automakers first, and not foreign companies. Inflexion point: Gary Coleman, Managing Director of Global Industries at Deloitte, explained to CNBC Africa China needs to shift investments towards global growing sectors such as IT software, Marketing and Logistics. Implementing reforms takes time, effort and investments. Among them, education is seen as a priority, as “by 2025 there will be 40mn job openings that the labor pool is simply unable to supply because the skillset of the unemployed don’t match the skillset that are required”. He proposes that China government and private sector work together to define skill set needed and build a curriculum, before he mentions transparency as another reform to encourage. The Economist warning for developing economies might be relevant here: “Slower growth will mean fractured political coalitions and geopolitical tension. Disappointment among the citizenry will create strong incentive to politicians to identify scapegoats of the usual sort: ethnic minorities and foreigners. It is in everyone’s interest to manage this downturn sensibly and cooperatively; governments should be working together to secure financial stability and find new ways to expand trade. But just at this moment, flipping through the daily headlines, sense is not necessarily in great supply”. Targeted public investment: The government is targeting investments in SMEs and social housing, as reports Les Echos. 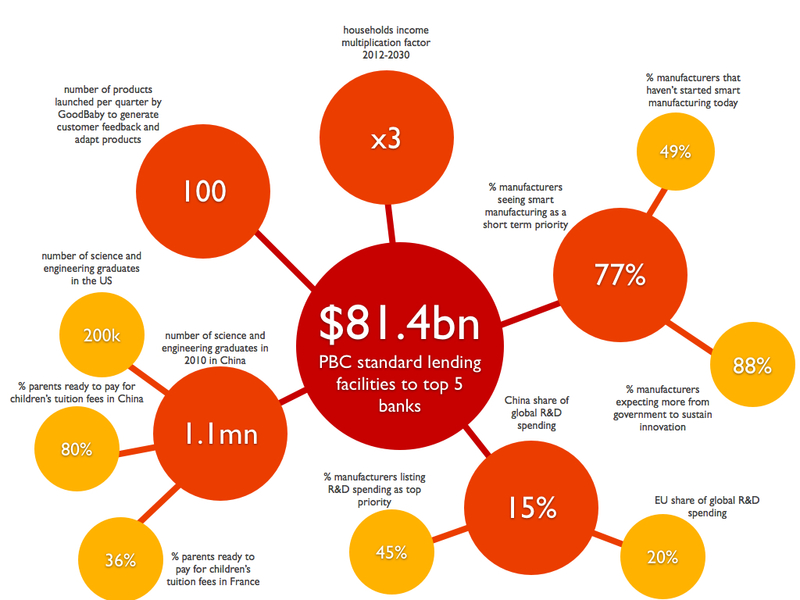 The People’s Bank of China (PBC, the central bank) will inject US$81.4bn into the country’s top five banks via standard lending facility (SLF, source: The Economist)). The objective is two-fold: reduce borrowing costs by easing interbank market conditions, but also confirm China government is in charge. Emerging local strategies: The Economist argues that China has already developed very localised innovation strategies and capabilities, which is a crucial point to understand the country’s attractiveness and risks. 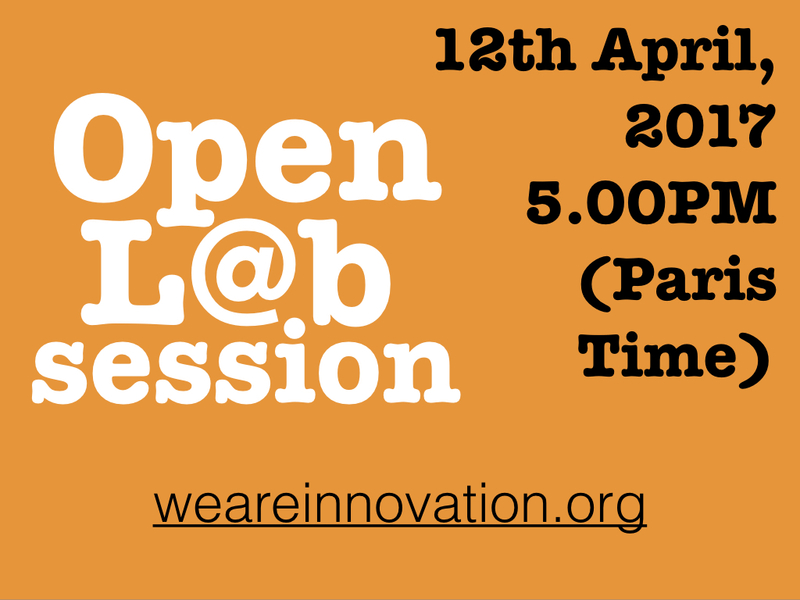 They have their own innovation style, sometimes launching more than 100 products per quarter and generate customer feedback. They are also creative when it comes to create a whole ecosystem from scracth, like Hi Di lao, a hotpot restaurant chains which struggled for recruiting and retaining, who now offers education and trips abroad for employees and their children. The innovation centre established by Pepsico in Shanghai in 2012 has been granted authorization to increase number of product testing. Developing new opportunities: To support these trends, China total households income is set to triple between 2012 and 2030, as explains WEF. Hence the idea of using existing examples of eco-city, eco-parks and advanced industrial symbiosis practices, to develop a circular economy where “refurbished products could be sold in parallel to new products without noticeable cannibalization, and could even potentially dampen the extent of the counterfeit market in China.” Deloitte’s survey shows 77% of manufacturers agree that building smart manufacturing capabilities is important in the near future, 49% have not yet started. 88% expect more from the government to sustain innovation. 45% of respondents think R&D spending is a priority. Focus on education: As Deloitte report shows, China is also giving birth to highly talented scientists, who develop their own innovation style and entrepreneurship, although “central planning could stymie innovation and market opening reforms may be required”. China today accounts for the second largest R&D spending in the world (15% of global spending), which exceeds R&D spending of each nation of the EU (20% of global spending as a whole). With such a huge population, the country provides the largest supply of graduates with degrees in science and engineering (1.1mn vs. 200k in the US). Le Monde shares results of HSBC report showing that 80% of Chinese parents are ready to pay for their children’s to study, against 36% for France, 75% for US, 77% for Brazil. 78% of Chinese parents are saving money for college/university studies of their children, 73% UK, 67% Brazil. The rapid growth of middle class generates new needs for innovation, mobile internet gaming and chat. There are even business friendly regional clusters to help create new type of start-ups. Learning adaptation: There are enterprise stories that relate how Chinese companies have adapted to globalisation. One of them is Lenovo, as reported by Strategy & Business. As an offshoot of a Chinese government research institute, the company lacked leaders who “had operated outside Chinese-speaking Asia”. Yet they had to face challenging cultural differences when dealing with executives from IBM, “a sophisticated multinational active in 160 markets”. As the article explains, “Gina Qiao, who was a member of the Lenovo team representing human resources, recalls that she was completely baffled by IBM’s compensation and pension system. Nothing like it existed in China”. Management style of two cultures had to find a way to work together, with behaviours like challenging authority that were simply inexistant in China. Another example is one of Lenovo’s CEO complaint about the company’s “yes, yes, yes” culture when stepping down after global financial struggles that also hit Lenovo. Chinese had to learn the capabilities needed within a multinational company. “They came to the United States ready to learn and absorb expertise,” and they learnt. site needs a great deal more attention. I’ll probably be back again to read through more, thanks for the info!